I don’t really spend much time on Facebook. Maybe, it’s because I don’t fully understand how it works and what I can do with it. This morning, though, I clicked on an icon I had not clicked on before. It opened an overview of what my 281 friends had been up to over the past day or so (at least this is what I think it was showing…). – By the way, one of our daughters told me that 281 friends is a pathetic number. 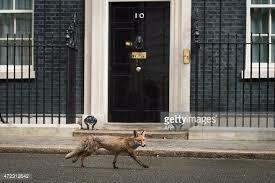 Anyhow, one of my friends apparently was on a visit to London and posted the picture of a fox. He couldn’t believe that this wild animal had made it into the middle of one of the busiest cities in the world. Interesting. But – so what? The brilliant bit came in a comment by a friend of that friend who lives in London (not sure whether the two friends had met in London for a pint, though it didn’t look like it, because if they had, he wouldn’t have had to post that comment on Facebook). They (the foxes) are everywhere in London. The countryside is full of rabbits. This is because foxes have discovered that rabbits run faster than bins. We always knew that foxes were really smart, but this is the ultimate confirmation. There must be a lesson in this kind of “thinking outside the bin”. Why running after the things you know are really hard to catch, when the things you’re looking for are readily available if you just looked for them somewhere else? I was thinking how this fox-intelligence could be applied to the situation we find ourselves in… I had a few ideas. What do you think, any ideas yourself? It was a really quiet day today. For a change. There were no meetings, no-one calling the house, no post- and delivery men ringing at the door, no appointments. I think Pádraig enjoyed that too. Last night, Pádraig’s famous friend, the bass voice of the RTÉ Philharmonic Choir, who during the week had performed what must have been one of the most difficult pieces of choral music, written by Stravinsky, came over for a visit. It was a lovely night. Tonight’s Boston to Brewster fundraising and awareness cycle got postponed to next Sunday. I used the time to have a really long conversation with a mother whose child was brain damaged at birth. What this family went through in the past years is extraordinary. Their daughter beat all odds, not only survived, but developed into a girl with tons of personality into the family that not just deeply cares for her but is including her as a ‘just’ another member of the family: life as ‘normal’ as possible under the circumstances. Solutions to problems, ways to deal with extremely difficult situations, are often closer than you think. No need to chase rabbits in the country, far away.